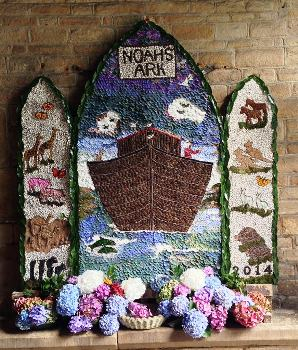 Well dressing is Derbyshire’s most famous tradition, although Chesterfield didn’t take it up until 1864 when the pump in the Market Place was decorated after a very dry summer. Each year there are two Well Dressings in Chesterfield, one in the Market Place and constructed by the Tourist Information Centre staff. The second in the Crooked Spire and decorated by members of the congregation, friends and families. 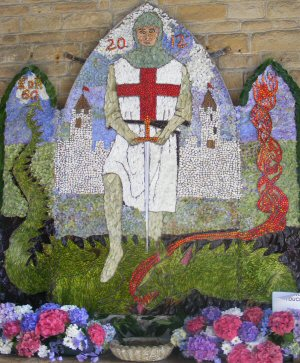 From the 4th September to the 8th September 2017 the ladies of the Crooked Spire Flower Guild, along with friends and families, began the building and construction of their Well Dressing. This took place in the porch of the church. The construction of the well dressing is a skilful art and usually takes about five days to perform. Wet clay is spread to a depth of a couple of inches across a wooden backing board, a design is ‘pricked out’ using a paper pattern and then petals and other items are placed in the areas laid out by the design. This is a laborious and time-consuming process, and the clay has to be kept damp or it will crack and the petals will fall off. 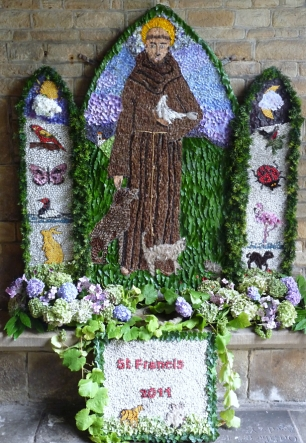 Following the 9.30 Mass on Saturday the 9th September the Well Dressing was blessed by the Reverend Patrick Coleman and remained on show for one week. 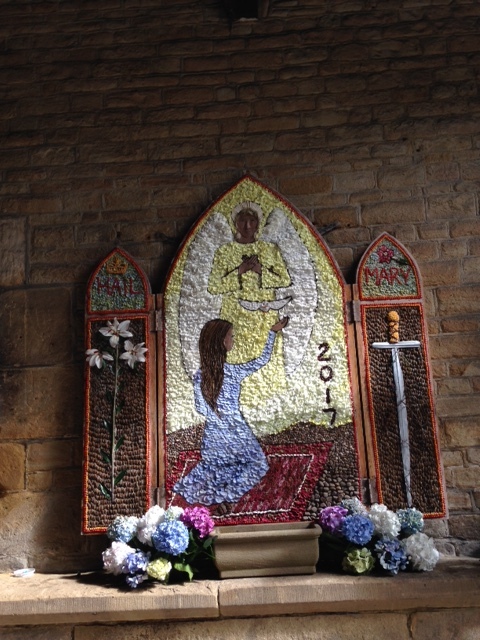 All donations made to the well dressing will go towards the day to day up keep of the Crooked Spire. Well Dressings see previous years….